The weak clipper that moves across southern Canada yesterday into Sunday has merged / fallen apart within a major low pressure center currently over the Great Lakes. 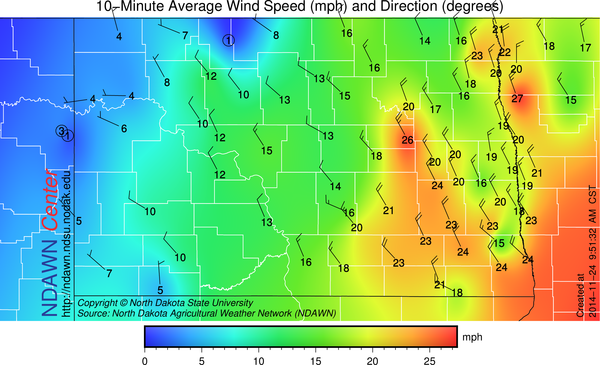 Eastern North Dakota on the back side of the tight pressure gradient where the wind will be at least 15-30 mph much of the day. The sky has cleared across most of North Dakota as of late morning. The wind on the image below is mostly the very light snow cover on the ground. The warmer temperatures over the weekend did melt much of the snow that was along the North Dakota / South Dakota border since the snow event from November 10. Snow totals from last night were generally under 1 inch an much of that blew into piles, meaning that the from a satellite perspective, not much is going to show up on the ground. The lack of snow on the ground may change in the next couple of days as another Alberta Clipper will be moving across North Dakota later on Tuesday into Tuesday Night. 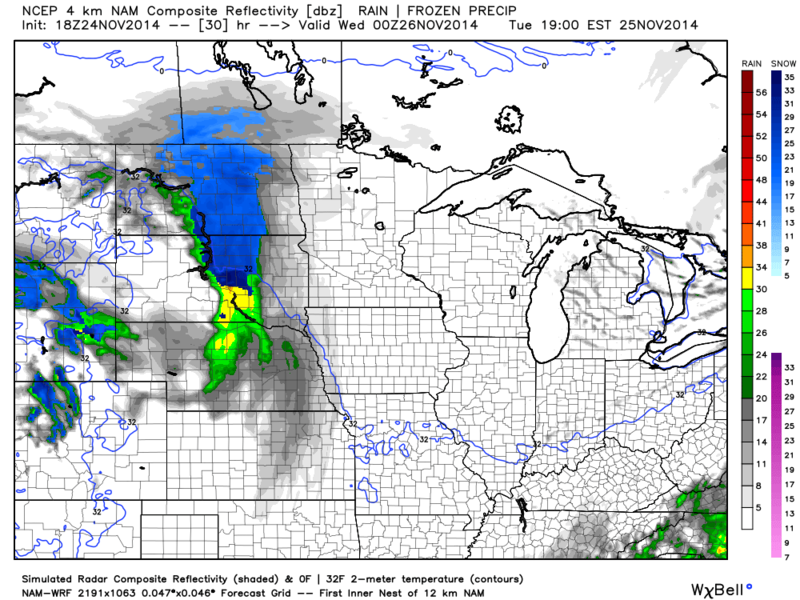 Certainly not the entire state of North Dakota, but this clipper will likely have a narrow band of 1-3 inches of snow. Plus the wind will pick up on the back side of this system. There will be another clipper on Thursday Night into Friday and yet another this weekend. None of these look like major events, but all of them will impact travel of course. So be on the lookout for a series of light snow systems over the Thanksgiving Weekend Holiday.